Randy Ball grew up in Tyler, Texas. His father was a pilot and his great uncle was a 56-mission veteran who flew B-17s in World War Two. With the war’s end, Randy’s uncle served as pilot to President Harry Truman. Licensed to fly while a teenager, Randy checked out in the T-33 at an early age. 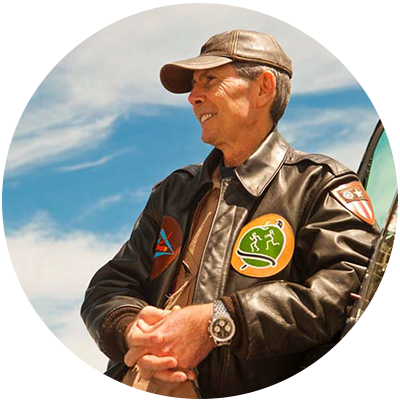 Randy was mentored and instructed by a host of ex-military fighter pilots. Although a civilian, he received training and experience in ejection seats, high altitude flying and a host of other skills and disciplines that set him on the path to become America’s most prolific jet fighter demonstration pilot, with over 1,000 performances to his credit over the span of 27 years. What Makes the MiG-17F A Unique Aircraft? The MiG-17F was one of two adversaries of American warplanes over the skies of Southeast Asia, the other being the MiG-21. The MiG-17F could out-turn any American fighter. It can enter an 8G turn at 350 knots and exit the maneuver without “bleeding energy.” No American fighter could match the turning performance of the MiG-17F until the F-16 Fighting Falcon appeared, years after the conclusion of the Vietnam War. The MiG-17F proved deadly to American fighter pilots during the Vietnam War. The reason the Navy established its Fighter Weapons School known as “Top Gun” was to teach American pilots how to fight and defeat the MiG-17F and the MiG-21. What Is the Relationship of the MiG-17F to the Movie “Top Gun”? The ability of the MiG-17F to execute an 8G turn without bleeding energy was classified information the picture’s technical advisor Commander Duke Cunningham inadvertently disclosed during the development of the movie. Because of the need to keep that data secret, a scene was contrived in the screenplay where “Maverick” (Tom Cruise) performs a rapid deceleration to force the MiG pilot to overshoot. This scene in the motion picture “Top Gun” has some basis in fact. A MiG-17F pilot behind an American fighter had to pull a considerable amount of lead when following an American fighter in a turn. The MiG-17’s nose would obstruct the MiG pilot’s view of the American fighter. An alert weapons systems officer in an F-4 could look backwards and detect this so that the American pilot could momentarily make an abrupt power reduction and promptly return to full power, causing the MiG-17F to flash past the American fighter exposing the MiG to destruction from the American fighter’s rockets and or gun. What Gives the MiG-17F Its Extraordinary Turning Performance? If you study the wings on a MiG-17F, you will note that the inboard sweep is about 45 degrees while the outboard sweep is about 48 degrees. The outboard portion has less leading-edge sweep. Also, the airfoil on the inboard wing panels does not have as much camber as the outboard wing panels. These aerodynamic refinements to the wing, structure, together with the fences on the wings designed to prevent the separation of the boundary layer over the wing along with the Klimov VK-1 engine with afterburner and thrust of 7,452 pounds are the design features that give the MiG-17F its extraordinary turning performance. What Kind of Performance Is Available from A MiG-17F? Besides its ability to sustain an 8G turn and not bleed energy, a MiG-17F can attain 715 miles per hour (Mach 1.04), and climb to 30,000 feet in three minutes. Its initial rate of climb is 14,000 feet per minute. The MiG-17F while capable of a magnificent rate of climb and short turning radius is a short range defensive fighter. Even with drop tanks, its endurance is only about an hour and a half. Long cross-country flights require frequent fuel stops. The aerodynamic refinements and design qualities of the MiG-15, the ancestor of the MiG-17, MiG-21 and MiG-23 aircraft, were, in large measure, the product of data acquired from captured German engineers. Unfortunately, the British sold the Soviets twenty Neme engines, together with the drawings and the rights to produce the engine. In the absence of spy satellites after the Second World War, the appearance of MiG-15 fighters over Korea came as a real surprise to American pilots. The MiG-17F was developed in response to lessons learned from the Korean War. The Russians developed a stage five burner in the Klimov VK-1 engine. While America learned the need for a stabilator in transonic/supersonic flight courtesy of Chuck Yeager and the Bell X-1 rocket plane, the Soviets came to the same conclusion by equipping the MiG-17F with a stabilator. In order to separate the stabilator from the shock wave of supersonic flight, the MiG-17F has pronounced anhedral to the wings while the stabilator is positioned high on the vertical stabilizer. The later versions of the F-86 were similarly equipped with a stabilator though not perched at the top of the horizontal stabilizer like the MiG-17F. The anhedral to the wings makes the MiG-17F less stable and more maneuverable, qualities you need for a fighter aircraft. Soviet and American engineers were trying to find ways to prevent airflow separation from their swept wing aircraft. The Americans with the F-86 Sabre opted for leading edge slats, a practice employed on the Messerschmitt Bf-109 Series of aircraft. The Soviets elected not to use leading edge slats. Instead, they relied on wing fences to prevent the separation of boundary layer airflow at high angles of attack. Leading edge slats require rollers and additional structure to accomplish their operation. However, when retracted, there is little, if any, parasite drag. The wing fences on the MiG-17F are fixed, require no rollers or articulating components. However, they do generate parasite drag with a reduction in the aircraft’s top speed. In time, a North Korean pilot would defect and deliver to the Americans an intact MiG-15 for study and evaluation. However, with the outbreak of the Vietnam War, MiG-21 and MiG-17 aircraft presented dangerous threats to American aircraft that were not fully appreciated. While the MiG-21 was much faster and provided better climb performance than the MiG-17 series, most air combat was taking place below Mach 1 around 350 knots. And this reality meant there MiG-17F posted a real threat to American fighters due to its maneuverability and extraordinary rate of turn. It was the harsh lessons being learned in the skies over Southeast Asia that led the U.S. Navy to develop the Fighter Weapons School known as “Top Gun”. While the United States obtained a MiG-15 for flight evaluation, it was the Israeli government that secured one or more MiG-21s and MiG-23s that were gifted to the United States government for flight evaluation and testing by the 4477th Test and Evaluation Squadron (the “Red Eagles”) in Area 51. Red Eagle pilots would report for duty at Edwards Air Force Base so as to not arouse suspicion. They flew to Area 51 conducting flight tests in the captured Soviet aircraft. The $250.00 toilet seat that aroused suspicion and ire after a CNN story, was a “funding mechanism” to supply the capital necessary for flight operations of the Red Eagles. Can you hear Julius Levinson’s query in “Independence Day,” regarding Area 51, “You don’t actually think they spend $20,000 on a hammer, $30,000 on a toilet seat, do you? Most American pilots have been told Soviet bloc aircraft are crude and inferior. The Soviets we are told prefer quantity to quality hoping to win in combat with sheer numbers. An examination of the MiG-17F may lead one to other conclusions about the philosophy of Soviet engineers in the design and construction of fighter aircraft. The structure of Randy Ball’s MiG-17F is robust duraluminium. All of the interior surfaces have been anodized. The wiring is silverset which is very expensive. The wiring is as flexible today as it was when the aircraft was built. American F-86 and F-100 of similar vintage have wiring that is brittle by comparison. Over the course of an airshow season, the Klimov VK-1 engine will consume approximately 3 ounces of oil. This confirms the engine was built to very precise tolerances. Performances by Captain Randy Ball in his MiG-17F are electrifying and spectacular. The aircraft flashes past the Flightline at .91 Mach. It climbs vertically at a remarkable rate, rolling straight up into the heavens. These flight demonstrations are at the top of the pyramid of airshow performances. Randy flies his MiG-17F with extraordinary control and precision. Randy and his assistant Erin Kelley keep the MiG-17F in immaculate condition and working order. As remarkable as Randy’s performances are in the MiG-17F, the aircraft has many things to teach us about the brilliance and talent possessed by Russian engineers and technicians. A careful examination of the MiG-17F reveals the capabilities of our adversaries. Their aircraft are not crude flying machines cobbled together. They are robust, powerful aircraft with performance capabilities superior in some respects to United States aircraft of similar vintage. Captain Randy Ball and his MiG-17F have a great deal to teach us if we are willing to learn.